I have exciting news! I have fairly recently acquired Sugar Gliders!! Sugar Gliders are small marsupials, which are in the same family as the kangaroo or koala bear, not the rodent family such as the squirrel or rat. They are originally from the rainforests of Australia and Indonesia and have been domestically bred in the United States and are considered exotic pets. Sugar Gliders are legal in most states, illegal in a few, and legal with a permit in a couple of states. Fortunately, they are fully legal in Maryland! The name Sugar Glider stems from two facts. The first part of their name is obvious because they love the sweetness of fruits and vegetables. The last part of their name is referencing the gliding membrane that allows them to glide. The membrane stretches from their wrist to their ankle and allows them to glide, not actually fly, from place to place. 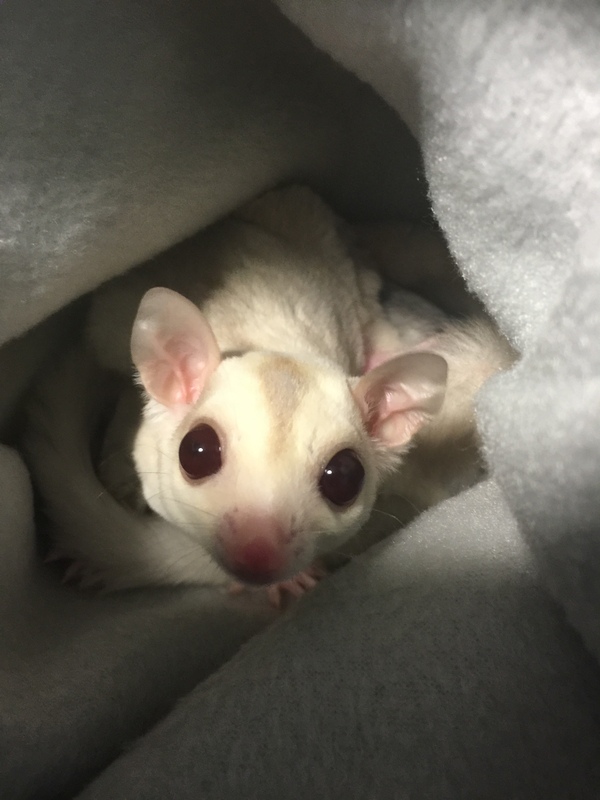 Sugar Gliders are colony animals. In the wild, they live in groups of 10-15. It is highly recommended to have at least two at a time. They cuddle together, hang out together, groom each other, and even sleep together in the same pouch most of the time. Sugar Gliders are nocturnal animals. They sleep during the day and come alive during the night. They eat at night along with fly around their cage, run on their wheel, and even bark at each other! During the day, they mainly sleep and can be carried around in fleece pouches and/or fleece lined purses. (1) The most common color is the Standard Grey which fur is various shades of grey and white. (2) White Face Blonde: refers to the lack of a black bar that is normally seen under the gliders face. (3) Black Beauty: this one is similar to the Standard Grey but has very dark charcoal markings. (4) Platinum: very light silver with a faint stripe that runs the length of their back. (5) Cremeino: has cream coloring and deep ruby eyes. (6) Leucistic: have pure white fur, with black eyes. (7) Albino: have no pigmentation, making it white. It can be distinguished from the Leucistic by its bright red eyes. (8) Mosaic: come in many different patterns which show different amounts of white pigment on their body. (9) Piebald: has a variation of the Mosaic that has alternating irregular color patterns of large white unpigmented areas and dark pigment on their body. A big cage is a must! Suggies love to jump around the cage! They also love toys, toddler plastic ones to be specific! Just be sure to remove batteries or anything that can they can get their paws or heads stuck in. I have plastic buses, houses, ships, and a few other cute toys that they LOVE to play in. When I put a new toy in their cage, at night, they immediately go to it and look around it. Another must have is a proper running wheel. A Stealth Wheel is the best in my opinion. Mine love to run and jump in it and then sit on the edge while it spins. Very funny to watch! Their sleeping pouches, and other various other cage items should be made from fleece material. This is because their delicate nails will not rip or pull on it. In my cages, I have matching fleece bridges, vines, hammocks, and different shaped pouches and lots of toys for them to play with. I even have little plastic chests that I put treats in. They somehow open them and steal the treats! There are many diets to chose from but my favorite is the TPG Diet. This diet is divided into little batches, each one 1.5 tablespoons per glider daily. Personally, I buy plastic containers (for condiments) and each one holds about 2 ounces and I overfill each one and it feeds two gliders for one day. Favorites include: oranges, papayas, tangerines, pineapples, mangos, cantaloupes, bananas, kiwi, peaches, strawberries, blueberries, raspberries and cherries that have been pitted. If you peel a fruit before you eat it, then peel it for your sugar glider. DO NOT FEED RHUBARB. Vegetables – fresh or frozen – not canned. When using frozen vegetables, get regular mixes (no sauces or Asian flavoring). Favorites include: sweet potatoes, kale, collards, green beans, , beets, peas, lima beans, carrots, jicama, bok choy, squash, red bell pepper and snow peas. Small amounts of corn are ok but be very careful. Corn is high in phosphorus and it is fattening and of course sugar gliders love corn so they will always eat that first. Small amounts of broccoli and cauliflower are ok, but overdoing produces excess gas in the sugar glider and that makes them very grumpy. DO NOT FEED GARLIC, LEEKS OR ONIONS OF ANY KIND. You can substitute regular orange juice if you are unable to find one that is calcium fortified. Protein – Favorites include cooked chicken, ground turkey and eggs. You can boil, broil or roast the chicken, pan cook the ground turkey using extra virgin olive oil and scramble the eggs. 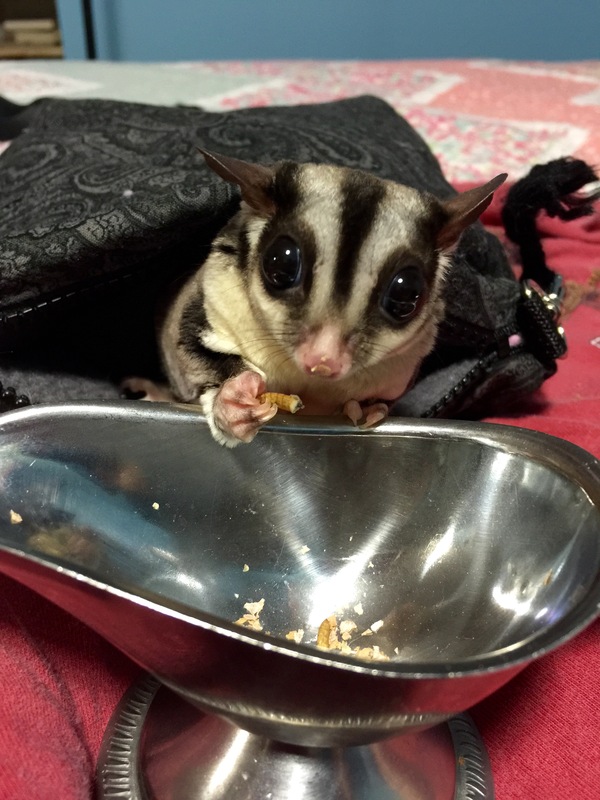 We do not recommend you give your sugar gliders pork or beef because of the high fat content and once again, fat gliders are not happy and health. This is optional if you are using fresh fruits and vegetables. 1. Finely chop your fruits and vegetables. We recommend using a food processor. If you do not have one, make sure you chop your fruits and vegetables into small pieces. Remember the size of the animal you are preparing food for. 2. Cook your protein – chicken, turkey, or eggs. 3. In a large bowl, put all ingredients except the oatmeal and stir vigorously. You want to make sure all ingredients have been incorporated and mixed thoroughly. 4. Depending on the thickness of your mix, add oatmeal. You do not want a runny or too thick of a mix, but one that has the consistency of a cake mix. 5. You will want to divide the mixture in smaller containers to freeze. Here are some pictures of my suggies. They are all named after Harry Potter characters! Dobby, Winky, Nymphadora, and Minerva. Dobby and Winky live in one cage. Dobby is a standard grey. He is fairly friendly and will let us pet him, he doesn’t care for being picked up and may give a warning little nip if he is uncomfortable. He loves treats, specifically live meal worms (as you will see posted). Winky is a White Face Blonde and is not friendly but is getting better. She used to lunge, try to bite painfully, and make loud crab-like noises. Now she doesn’t lunge, crabs less, and willingly accepts treats! In the other cage, Nymphadora and Minerva live. Nymphadora is our sweetest, most loving glider of all. She has beautiful Mosaic coloring with bright dark sparkling eyes. She loves attention and is perfect! Minerva is an adorable Cremeino with bright ruby eyes. She watches Nymphadora’s behavior and is nearly as sweet. She makes crabby noises but rarely bites. She likes to groom my hand and is super cute!